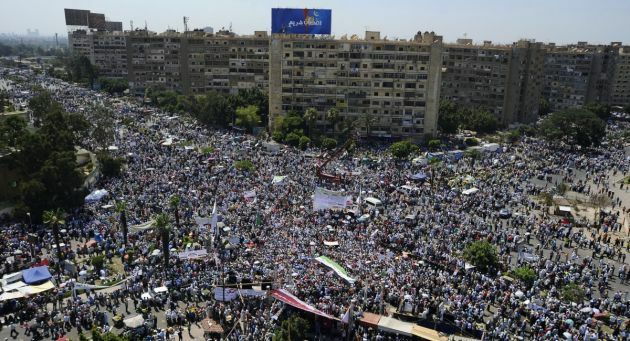 CAIRO, (Reuters) - Egypt's Muslim Brotherhood has staged a show of strength in Cairo, rallying a huge crowd to demonstrate support for President Mohamed Mursi - and warn opponents who hope to force him out. The opposition on Friday called it an attempt to "terrorise" them before mass rallies they plan for just over a week's time. Crowds waving the flags of Egypt and Islamist movements, including hardline allies, packed avenues around a suburban mosque to back the elected head of state before anti-Mursi protests planned for June 30, when he completes a first year in office marked by division and economic problems. "We promise them, they will be crushed on this day," Tarek al-Zumar, a Salafist former militant told the crowd, many tens of thousands strong, who had travelled from all over Egypt. "It will be the final blow to anyone who claims that they have tens, thousands or hundreds of thousands with them," said Zumar, who spent 30 years in jail for his role in killing President Anwar Sadat and was freed only after the next Egyptian leader, Hosni Mubarak, fell in 2011. "God is great!" chanted the crowd, packing streets not far from where Islamists gunned Sadat down at a parade in 1981. The opposition "Rebel!" alliance, campaigning to force Mursi to resign, said on its Facebook page: "These numbers, regardless of how big they get, represent all the strength and arsenal of the Brotherhood. They will not be able to add a single person." Nonetheless, the rally, which started after noon prayers and lasted well into the evening, showed the Muslim Brotherhood's power to mobilise supporters that propelled Mursi to victory in the presidential election - the first time Egyptians had a chance to choose their leader freely. It also pointed to the deepening ties between the Muslim Brotherhood and the harder line al-Gamaa al-Islamiya, the group to which Zumar belongs. This follows a year in which Mursi has been unable - or unwilling - to draw in non-Islamist parties and forge a consensus to reform a limping economy and stabilise the Arab world's most populous nation. Mursi had come to power promising to be a president for all Egyptians, but his opponents have accused him of hijacking the 2011 revolution to entrench the power of the Muslim Brotherhood, which was banned under Mubarak. Hardships from power cuts, fuel shortages and rising prices have fuelled public discontent. Mursi's opponents say they have gathered about 15 million signatures - more than the 13 million votes that elected the president a year ago - on a petition calling on him to step down; they say new elections could end the paralysing polarisation of society, though no obvious leader has emerged to build consensus. But in a warning to the liberal and leftist opposition - and anyone in the state who might share their desire to remove Mursi early - another hardliner told the rally that Islamists would press for a pure Islamic state were Mursi toppled. "Some who lost at the ballot box want to take power through anarchy," said al-Gamaa al-Islamiya's Assem Abdel Maged, who once shared a cell with al Qaeda's leader Ayman al-Zawahri. The opposition - which the Brotherhood says has consistently snubbed Mursi's offers of government jobs and political dialogue - has attracted support from many Egyptians who are less politically engaged but exasperated by economic stagnation. Supporters of the Brotherhood feel their electoral success is under siege from vested interests rooted in the Mubarak era. There was no trouble evident at the Cairo rally, though there were scuffles in Alexandria when Mursi supporters and opponents faced off briefly in Egypt's second city. In Cairo, Brotherhood members armed with green staves said they were ready to protect demonstrators from "thugs", noting dozens of injuries in clashes across Egypt in the past week. The last major wave of anti-Mursi protests was in January and coincided with the second anniversary of the anti-Mubarak uprising. Those provoked countrywide trouble. Diplomats in Cairo are expecting at least some violence come June 30. "There are people seeking a coup against the lawful order," said demonstrator Gaber Nader, 22, his head protected from the burning sun by a green Brotherhood flag. "Dr Mursi won in free and fair elections like in any state in the world," Nader said. Al-Gamaa al-Islamiya, most of whose members renounced violence more than a decade ago, was out in force at Friday's rally. Mursi infuriated many Egyptians this week by appointing one of its members as governor of Luxor, a town where members of the group massacred 58 tourists at a pharaonic temple in 1997. One woman, in black veil and green Islamic headband, said she feared the removal of Mursi would return Egypt to the army-backed rule under which her son was tortured: "They destroyed his mind," Zeinab Abdullah, 54, said. Such fears among Islamists have led some to warn of civil war if the generals who oversaw the transition from Mubarak move against Mursi. Responding to calls for such an intervention, the head of the army signalled in May there would be no such move. Opposition groups range from the young liberals who first took to Tahrir Square in January 2011 to challenge Mubarak, to conservatives yearning for the stability of army rule. Many in Egypt's 10-percent Christian minority also fear the Islamists. Mohamed ElBaradei, a former top U.N. diplomat who is a leader of the opposition campaign, told Al-Hayat newspaper that economic problems were increasing support for a movement which he said hoped to end the "total polarisation in Egypt". ElBaradei said a united opposition push could bring an early presidential election that would unseat Mursi, though he himself would not run: "The division of the opposition put Mursi in power and I believe it has realised this mistake," he said. Prime Minister Hisham Kandil said he feared there could be violence on the part of protesters and warned them against trying to overturn the electoral process. He told a television interviewer: "Real change comes through the polling station." Rhetoric has grown more toxic in recent days: one Islamist cleric referred to Mursi's opponents as "infidels" during a rally attended by the president last week. The opposition are billing it as Mursi's last days in office, hoping for a repeat of the uprising that toppled Mubarak two and half years ago. "Mursi and the Brotherhood know they are in a predicament - the Egyptian people are revolting against them," Heba Yassin of the leftist Popular Current movement said of Friday's rally. "This is an attempt to terrorise the opposition."